With a very heart i write this blog. Just 2 hours back PAKISTAN has lost one of its eminent personalities, a great leader and a wonderful human being Benazir Bhutto. Its a shameful act by the Musharaf government by not giving enough protection to one of its great leader and led way to her assasination. Bhutto was shot 5 times using an AK-47 rifile and a suicide bomber blew himself off killing atleast 30 persons. 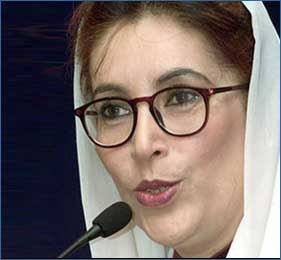 Benazir succumbed to her injuries and died at around 6:16 PM pakistan time. I had a high respect for this great personality, i admired her character, strength and courage by which she fought the musharaf government. She came back to pakistan during the month of august 2007 after being in exile for over 9 years in the UK, she was determined to dethrone Musharaf in this coming general election and was sure of accquiring the term for the third time, but fate decided the other way and this wonderful soul was taken back by the almighty Allah. I sincerely pray for her soul to rest in peace.